The simply answer would be to hire us – we can guide you every step of the way; that doesn’t make for a good blog post though, does it?! Over the past five years we have established a number of new events, supported various events, as well as increased the profitability of some longstanding, well-established events. We follow a tried and tested organisational plan for each event. Here is a snippet of that plan. Work out what your event is all about. Who is it for? Where will it be? What wen’t well or no so well last time? What will the event look like? This is the creative bit – it’s possibly the most fun as you can throw around ideas and fantasise about what you would love, if budget, space and licencing was no object! So you’ve finishing fantasising about you are going to recreate Glastonbury on your village green. How much will it all cost? Where will the income come from? How will it all be spent? You have worked out you can afford your event, woo hoo! Now you need to make sure it’s safe. Do you need a Temporary Events Notice? What are the risks? Who owns the land? What happens if we find a child? What insurances do I need? 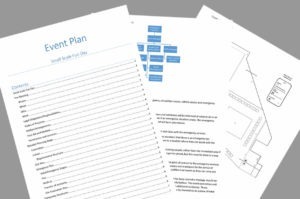 This step potentially the most important step – if something goes wrong on the day of the event, you want to know there is a thought through plan in place to resolve any issues. It’s no good doing all this planning if nobody knows about the event! Get out there and tell the world what you’re planning. Make sure all of your marketing designs are consistent and look professional; a professional design can make all the difference in perceptions of an event. Get a website. Get on social media. It’s the big day! Put your plans into place, let the crowds in and throw the most spectacular event everyone has ever seen!